Die for the cause of terrorism and the Ameer [the leader] of Pakistani Taliban will give you a formally signed and sealed certificate of martyrdom. We have heard that families of brainwashed young men from economically deprived families in the North West Frontier Province and Southern Punjab were being given around Pound Sterling 5000 in order to recruit them as suicide bombers. Giving them posthumous certificates for successfully getting themselves killed while "fighting for the greatness of Islam and for the cause of downtrodden Muslims" is a joke too far. 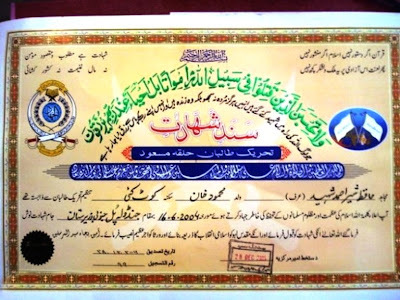 The certificate records the date and geographical location of "martyrdom" and is very formally stamped and signed by the "Ameer". I am not sure whether to laugh or vomit.